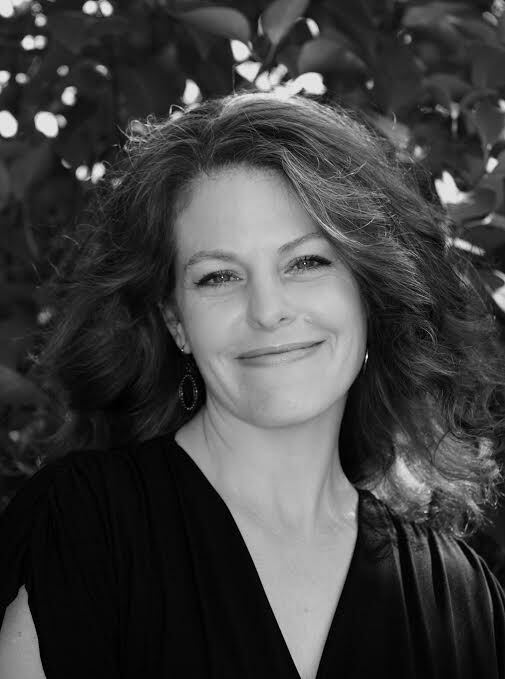 I am excited to share my first *NEW* interview since my blog has re-started -- 2016 debut author Wendy BooydeGraaff! 1. Salad Pie is such an unusual pairing of words. What inspired you to come up with this title? This is one of those times when the title came first, and then the story. My daughter and I were at the park and she was playing pretend and said, “Salad Pie,” which I thought was so clever and creative that I repeated it in my head over and over all the way home. Then, during her rest time, I scribbled out the first draft of the story. 3. How did you come to hear about Ripple Grove Press? SCBWI’s The Bulletin. They had a little blurb under the publisher notes section. I clipped it out and taped it by my desk so I could look at it for a little while. I researched them to make sure they were legitimate—there wasn’t a lot of information out there because they were so new at that point—so I submitted and hoped for the best. 4. What was the pitch that you sent to Amanda and Rob Broder that resulted in a contract being offered? An excerpt from the query letter: Please consider Salad Pie, my 600-word picture book about an imaginative young cook who doesn't want to include anyone else. 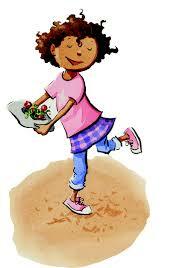 Maggie is determined to make Salad Pie alone because then everything will turn out just the way she likes it. When Herbert watches on the sidelines, he ends up being in exactly the right place at exactly the right time, and Maggie learns that sometimes a friend is the right ingredient for magnificence. Featuring a twist on timeless themes of childhood friendship and sharing space, Salad Pie is sure to engage the outdoorsy crowd and those who know the importance of play. 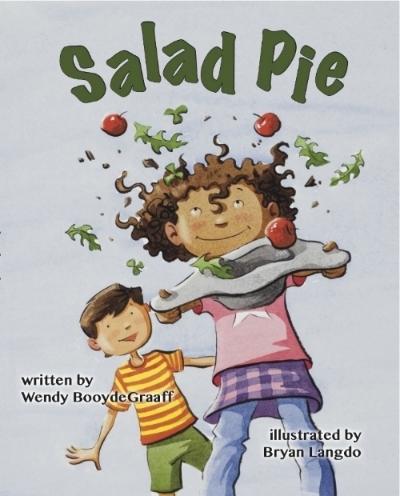 In my job as educational research data collector, I regularly observe preschoolers engaged in elaborate imaginative scenarios; Salad Pie speaks to their daily experiences. 5. How many times did you submit Salad Pie before you landed the contract? Lots—I didn’t really know what I was doing at first, even though I researched everything a ton—and there was a fake agent involved at one point years and years ago (yes, she’s actually in jail now. Always check Preditors and Editors first! ), so it took me a really long time to trust sending it out again. 6. What did you do when you received your first box of your new book? I let it sit in the entryway until my kids got home from school and then we opened it and sat around the box, everyone reading their own copy. I think I also read it out loud and had a glass of champagne. “The Ripple Effect” is a book drive Ripple Grove Press did in March with the Children’s Book Bank in Portland, Oregon. They collected books and also donated a bunch of Ripple Grove Press books that were then distributed to children living in low-income areas. This is important because having books in the home and reading a lot is linked to academic achievement, and academic success is one way to change the cycle of poverty. 8. Do you eat Salad Pie? Salad? Pie? Why or why not? I have never eaten Maggie’s Salad Pie, although in earlier versions, the story ended with Herbert taking a real bite. I don’t think crab apples, clover and shiny crinkly gum wrappers are palatable. They might be edible, but I don’t want to try it! I do love salad and I do love pie, and apparently there are a few recipes out there for salad pie, which I posted on the Salad Pie Pinterest page. 9. Name your favorite salad ingredient. Why? Baby lettuce because I can pick it from my own garden and eat the freshest salad in the world. 10. If you were a vegetable, which one would you be? Why? If I were a vegetable…I have never thought about this before. Maybe I’d be sugar snap peas because you can grow them in cool weather and they are one of the first veggies ready around here. They are nice and crisp and can be sautéed or steamed or raw. Also, they have little white blossoms and when they are really small, some of the flower is still on the end of the pod. I don’t know how that relates to me at all, except that it’s fun peeling off that little flower cap. 11. Name your favorite pie. Why? I love, love sour cherry pie. I also love rhubarb pie and key lime pie—all the tart flavours. 12. If you were a pie, which one would you be? Why? This is a tough one. I want to say Lemon Meringue because it reminds me of my childhood, but Lemon Meringues are very showy and the two times I made one, the filling got all soupy overnight and I don’t want to be the kind of pie that can’t hold it together when things get a little chilly (I am from Canada, after all). So I’d have to say rhubarb, because it’s not the most popular and yet it’s worth seeking out. Also rhubarb pie takes a bit more work to make than other pies because of the pectin thing, which is why it’s usually found with strawberries or raspberries. 13. Are you a pie baker? Yes. I almost never order pies at restaurants or bakeries because they are too sweet for my taste, so if I get a craving for pie, it’s best to make it myself. 14. When did you decide to pursue picture book writing? When I started writing, I wrote short stories and a really, really bad novel. When I was in college, I took a children’s literature course and that got me interested in current children’s literature. Mostly I’m pursuing the writing life, and much of what comes out is picture book texts. I think I wrote my first picture book text around 2005. 15. How long was your journey from start to first book? Who/what has been most influential on your journey? My journey started when I was very young and in love with books. Books were always my favourite presents, and they still are. I decided to start writing in earnest in 1996, but had several stops and starts. So until that first book, it’s taken years and years. Most influential have been all of the beautiful books I’ve read along the way. 16. What is your current picture book FAVORITE? Grrr. I don’t like picking favourites. 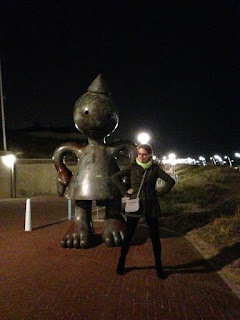 In fact, I wrote a whole blog post about my top ten favourites over at Nerdy Book Club. But since you are twisting my arm, I’m going to pick two: The Dark by Lemony Snicket and illustrated by Jon Klassen AND A Nation’s Hope: The Story of Boxing Legend Joe Louis by Matt de la Peña and illustrated by Kadir Nelson. 17. What was your favorite children’s television show growing up? Do you still watch it? I remember watching a soap opera after school for years and years. I was very young when I started watching it. I used to trick my older sisters by saying I wanted to sit with them and watch the commercials. Then when the program came on, they’d forget to send me out of the room. The allure that what I was watching was forbidden made the show even better. I watched it all the way through college, where my roommate would tape it for me on her VCR. I also watched Mr. Dressup on CBC (Canadian Broadcasting Channel). Oh how I loved that show. Every episode he’d go over to his tickle trunk and pull out a costume and—you guessed it—dress up! Another Canadian classic I loved was Friendly Giant. 18. Any books slated to come out in the next three years? 19. What are you working on now? More picture books and revisions on a middle grade novel. 20. What was your favorite child activity while growing up? I loved going outside and making mud pies. I have a framed photo of me playing in the dirt with a shovel, circa 1976. 21. What was your favorite toy? Do you still have it today? Quack Quack was a duck on wheels that I could ride around the house. Apparently I was given it one Christmas and loved it so much that I hopped on and wouldn’t open any other presents. I have no idea where that went. 22. What pop culture era did you grow up in and how did it influence you? The 80s featured neon clothes, power suits, Michael Jackson and hair bands (as in rock bands with long hair), and I loved it all. It was a classy era with all of the leg warmers, mullets, synthesizers and especially Miami Vice, which got me hooked on fast cars and fighting crime. 23. What is your favorite music to listen to? I like an eclectic mix: alternative rock, jazz, world music. 24. If you can make another type of pie, what would it be? 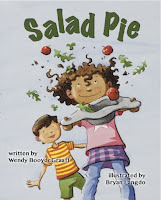 Wendy BooydeGraaff grew up making mud pies on a fruit farm in Ontario, Canada and now lives in Michigan with her family where she whips up all kinds of salads and all kinds of pie. 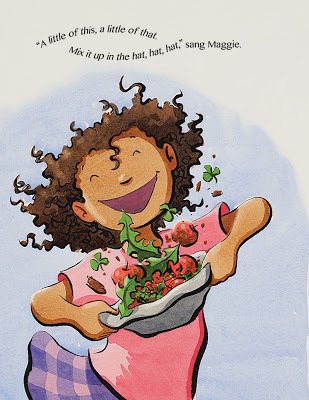 Salad Pie is her first book. Visit her online at wendybooydegraaff.com where you can ask a question that she’ll answer on the site. You can also find her on Pinterest andGoodreads. Please continue to support these authors by purchasing their wonderful books through the link beneath the book thumbnail. In addition, please feel free to leave your comments on this blog. Also please feel free to mine the My Word Playground archives for other gems and treasures. 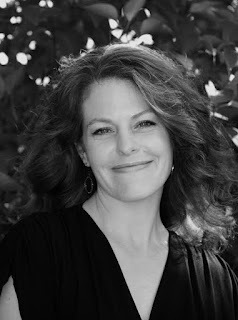 If you are an author with a traditionally published book who would like to write a Guest Post or be interviewed at My Word Playground, please visit www.literallylynnemarie.com and click on contact, or e-mail me at LiterallyLynneMarie.com. Thanks stopping by My Word Playground. Always glad to have you here! Fantastic interview! 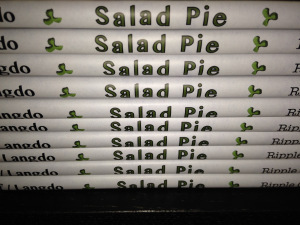 Thanks for sharing your path to publishing SALAD PIE. It looks adorable! Great interview! 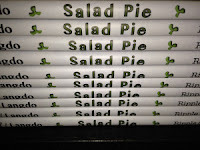 LOVE the premise of SALAD PIE! Enjoy the book launch! Thanks for stopping by My Word Playground, Laura! Hope to have you here as a Special Guest in 2017! Ah fun. Ripple Grove does great books.